On Thursday, 21st January, on the stroke of midnight, in layman’s language, the Government of Bermuda ran out of taxpayer supplied dollars. 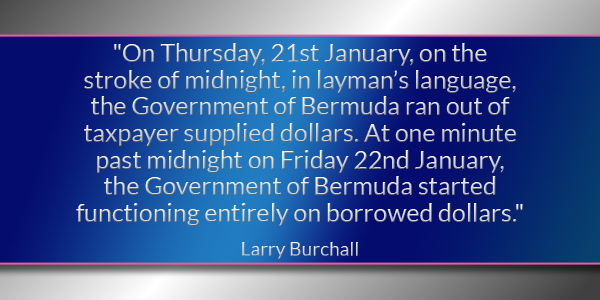 At one minute past midnight on Friday 22nd January, the Government of Bermuda started functioning entirely on borrowed dollars. Between 1st April 2015 and 31st March 2016, Government planned to spend $1,151.3 million even though Government was expecting total revenue of only $931.3 million. So Government deliberately planned to overspend by $220.0 million. Government’s 2015/16 planned spending of $1,151.3 million works out to $3.14 million a day, every day [$1,151.3 million divided by 366 days]. Spending $3.14 million a day means that Government’s $931.3 million revenue could only last for 296 days [$931.3 million revenue divided by $3.14 million daily spend]. Counting from 1st April 2015, those 296 days end on 21st January 2016. 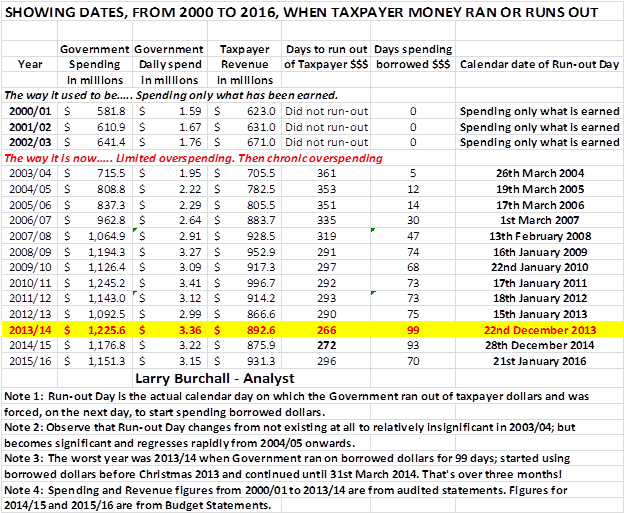 On this day – 21st January 2016 – Government will have spent the whole $931.3m taxpayer revenue that it hoped to get. Succinctly? Government ran out of taxpayer money. But there are still seventy  days left in this Financial [Leap] Year. So what happens on 22nd January 2016? Starting at one minute past midnight on 22nd January 2016, and for the next 70 days – right up to midnight 31st March 2016 – Government will be totally reliant on the $220.0 million that it borrowed to cover the $220.0 million ‘deficit’. Divide $220.0 million by the 70 days left, and you get back to $3.14 million a day. That’s arithmetic. Not politics. Arithmetic. Wave the magic wand of a General Election. Change both political parties. Elect a ‘fourth’ or even ‘fifth’ party. Install a Ninth or even Tenth Minister for Finance. The arithmetic won’t change. Drown the print and electronic media in words, talk and stare for hours into video and TV cameras, canvass on the doorstep; nothing changes that brutal fact. That simple yet brutal arithmetic will stay exactly as I show it. Up to 21st January 2016, every Government employee got paid in taxpayer generated ‘Bermuda revenue’ dollars. From 22nd January 2016, every dollar of their pay is a foreign dollar that has been borrowed from foreign lenders. From 22nd January 2016, from high to low, from the Governor down to the lowest paid Government employee, every dollar of pay and benefits will be a borrowed dollar. That fireman or policeman responding to an emergency will be paid with borrowed dollars. Any person or business supplying goods and services to Government will be paid with borrowed dollars. It’s like you and your household running out of money every month, and spending the last six days of every month living on Credit. In the 13 calendar years, between April 2003 and March 2016, the Bermuda Government lived and will live solely on foreigner’s money for two calendar years. It’s arithmetic. Not politics. Arithmetic. By the way, that $3,145,628 that gets spent every day includes a big chunk that’s priority sliced off – every day – and priority sent overseas to feed “Nanci” [Non Negotiable Costs = Interest + Sinking Fund = Debt Service Costs]. How big is that priority slice-off? Currently, it is $464,208. And that slicing-off happens every day – for 366 days. Now, a double insanity! Starting 22nd January, Government borrows that daily $3,145,628 and then priority slices off and ships out $464,208. So like some madly grinning financial psychopath, Government feeds Nanci with borrowed dollars! Crazy? Double crazy? Yes! But true. It’s arithmetic! Crazy arithmetic! Because $0.15 [15%] of every borrowed dollar goes to Nanci, and only $0.85 [85%] of that dollar comes to us, every Government dollar – borrowed or taxpayer – is always a ‘clipped’ dollar – an eighty-five cent dollar. Twelve years ago, in 2003/04, that clip-off was a mere one and a half cents [$0.015]. How did Government descend into this national financial hell where Government has actually spent as many as 99 days – fourteen weeks and a day – living on credit? The GGR accelerated Government’s descent into financial hell. In 2007/08 Government spent 47 days living on credit. When the GGR happened, the Bermuda Government was suddenly slammed backwards. From running-out in mid-February, Government suddenly ran out a whole month earlier. Government still has not recovered. Study the chart. Government’s 2016 predicament follows a twelve year build-up of actions and non-actions, decisions and non-decisions taken and not-taken by Government’s top financial managers. Regardless of past and present politics and party loyalties, 21st January 2016 still came! 21st January 2016! Run-out Day! Not a day for celebration. A day for sobering-up! People who say money doesn’t grow on trees have never sold marijuana.Medical marijuana would increase tourism and remove harmful addictive additives from addicting current users…the marijuana currently sold in Bermuda has heroin,crack cocain powder,and Chrystal meth added tuit to hook the user interface habit…then the dealer claims not to have marijuana and offers the more addictive drug…that is how that is done! Marijuana in pure form is non addictive.. But only!. It sure is nice. …and good for you too! This medical marijuana effectively is a personal choice and made illegal by nylon rope interests originally.. We chose the damndest reason to make it illegal….it is in fact a detterant to violence! We need this income.. And this tourism! This article should be put on a huge poster and hung at every polling station and all voters required to read it and PROVE they comprehended it, before they are allowed to cast their vote!!!! Our condition is bad, not hopeless. We can get out of this mess, if we pull together. 10 % of our budget is waste . $91 million dollars goes out the window every year. Can we save that money? Where does the money go: waste, theft, duplication of services, and low job productivity. The unions are too strong-no fault of there’s, and government is to weak. Our deficit is $220 million while our debt is $2.5 billion . We must wipe out our deficit immediately. Do we have the will to do it ? We do not have the will as no one makes the hard decisions. as a way to save money government needs to start using some of the prisoners for some of the the jobs done by w&e like grass cutting and picking up trash also painting. also why are government foremans drivind toyota suvs all they nee is a small van. But can we do it with no money darn? Yes we can. You must like what I say. And yet still the PLP complain about every attempt to reduce spending, and they keep suggesting new things to spend money on. “This will only cost $10m” they say. While appreciate the reminder, this isn’t really new news, it has been said for a number of years, particularly by our current Finance Minister. So while you may want to sound the alarm, remember, you aren’t the first. The minister knows we are borrowing to run, but it is important to remember that we are not borrowing as much as we did last year, or the year before that, or the year before that. In fact the borrowed cash now is about half, or less than what it was running at when Minister Richards took over. What we need to make sure is that he is able to cut it further this year, and hopefully eliminate this running borrowing within the next 2 budgets. Where we need to ring the alarm bells is that the current PLP are promising to return the borrowing to the unsustainable levels of 3 years ago, with no real ideas on how to pay for that increase… much less the bills they racked up last time, especially since there is an election in a few weeks. The numbers are wrong. He’s using the budgeted spending for some years – ie. 2012-2013. Budget was $1092.5 million, actual spending was 1274.5. Worst year was 2012-2013. The OBA then used a realistic budget figure in 2013-14 and the deficit dropped by 25% their first year. Note 4 in the chart states that the Revenue and Spend figures are from the audited statements of the Consolidated Fund. I check and cross check all my figures. The 2012/13 ‘audit’ figures and as repeated in other Ministry of Finance reports are that in FY 2012/13: Revenue was $866,578,000. Spending was $1,092,476,000. Those 2012/13 numbers are those reported and agreed by the Auditor General. Where, in what report or reports, is your 2012/13 figure of a Spend of $1,274,000,000 being reported? Your figure would give a 2012/13 deficit in excess of $400 million. The OBA didn’t dramatically increase spending the moment they were elected. They just passed a realistic budget, when the previous one had explicitly lied to make the deficit seem smaller (see: interest budget amount). That’s why there appears to be a big jump in budgeted spending between 2012/13 and 2013/14. One of the things that I’ve uncovered is that a lot of ‘adjusting’ takes place after the audited statements are put out. A second thing is that the ‘blue book’ of revenue etc… that is debated during the six week Budget Debate always has a ten year table [in the last pages] showing GovRev and GovSpen over a ten year period. From time to time, this Budget book table also has its figures adjusted. I look for consistency and reliability so that I compare apple with apples and keep the oranges far away. Not a simple task when dealing with Government’s own reports on its own financial dealings. If you look up FY 2009/10 in the last pages of the Budget book, you will find exactly the kind of thing that seems so normal in Government. You will find that for 2009/10 the Interest paid on Debt is reported as an incredibly low $1,695,000 and the Sinking Fund contribution is reported as $0. But look at the figures on either side, for 2008/09 and 2010/11. The Budget book contains the stuff that Parliament and the people/taxpayers are told. I avoid the sometimes puzzling minutiae of late accounting ‘adjustments’ and keep to clear revenue and spending [not expenses]as reported. I do note that there is never any discrepancy over REVENUE. Only over spending. That there isn’t a clear and consistent agreement over expenses and expenditure is just part of Government’s financial jigsaw puzzle – perhaps it’s intended to bamboozle the public. Thank you for your response. I believe your table dramatically understates the amount of spending for at least 2011 and 2012 (those are the numbers I checked). Perhaps reconciling back to net debt would provide a good check.